Pancakes are great. When I was little I always looked forward to Shrove Tuesday because it was pancake day! Dinner consisted of as many pancakes as you could possibly eat, accompanied by a variety of fillings. The most popular, and an all-time classic was sugar and lemon juice. Simple and delicious; hard to beat. Other household favourites were bolognese sauce; maple syrup; and – I think it deserves a mention, although I realise that this will cause severe discontent among some – Marmite. “Crazy talk!” I hear you say, but if you (like me) are not a hater but a lover, put some Marmite on your pancake along with some butter, it’s fantastic. The final addition to my list of classic and favourite fillings is a relatively new one for me. My friend Richard, a fellow pancake obsessive, is an advocate for butter and sugar being the all-time best pancake filler. I was surprised that I had never before thought of this combination, they are two ingredients that almost everyone is bound to have in their house, and it’s a winner. So if you make pancakes you must try it. Make sure you use plenty of butter; fry the pancake in butter and put more butter on after flipping and before adding plenty of granulated sugar. Sweet buttery goodness. Lovely.Today I decided to have a break from tradition and try some new fillings. 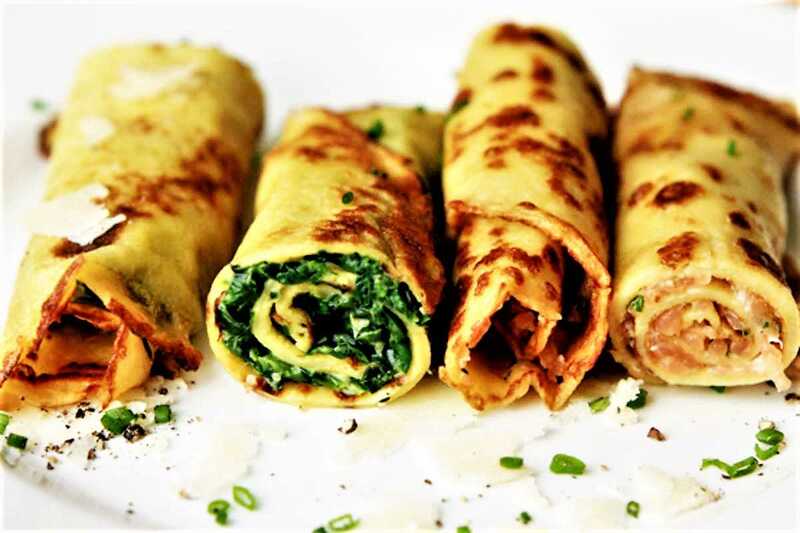 I found in my fridge some smoked salmon, crème fraîche and spinach… I waved my magic wand and very soon I had two delicious pancake fillings ready to be married in tasty happiness to some beautiful crêpes. Crack the eggs into a bowl, add the flour, a splash of milk and salt. Mix until a uniform consistency is achieved. Now add milk in stages, mixing to get a smooth texture in between each stage. Let the batter stand for 2 hours before cooking; this allows any air in the mixture to dissipate, ensuring that the pancakes do not rise when cooking and stay nice and flat. Thin the batter just before cooking with 50-100ml of milk. To cook the pancakes, get your frying pan nice and hot before adding a knob of butter. Once the butter has melted, pour in a small amount of batter whilst carefully tilting the pan to ensure that a nice thin even spread is achieved. Fry for a few minutes on each side, until nice and golden.